The news that Sebastien Bourdais had been confirmed as a Toro Rosso driver for this year was welcome in many ways. Even a month ago, Bourdais' chances looked slim, with STR apparently interested mainly in driver's sponsorship money being brought to the team. This is a terrible way to decide on drivers and, as I have said before, Sebastien was the good sense option having proved quick and reliable when fate was not against him last year. Add to that his experience and learning from 2008 and he was clearly the hottest property in F1 over the winter. Most fans would agree with that, I think. It was an interesting decision too in that it went counter to STR's previous management style. In the past, the team has been content to keep drivers hanging on until the last moment before announcing their choice; this time the announcement came soon enough to catch us by surprise. The difference is Dietrich Mateschitz, of course. With Gerhard Berger no longer running the team, Mateschitz has taken charge and already shows the decisiveness and common sense that was so lacking before. Whereas Berger seemed to thrive on conflict with his drivers, Mateschitz is very supportive, as demonstrated by his continued belief in Scott Speed at a time when the STR management could not wait to get rid of him. Consider, too, the common sense evident in Mateschitz's public statement on the matter. Which all seems a better way to go about things and must surely be good news for the team. The danger was that the majority of Mateschitz's energies would be concentrated on the Red Bull team in 2009 and that STR would suffer as a result; the decision to retain Bourdais' services is a good sign that Mateschitz will be able to direct both teams effectively. Finally, the decision was good for F1 itself. All too often recently we have seen the sport treat people badly, with popular races being summarily scratched from the calendar, the fanbase insulted by Mosley's suggestion that anyone who disagrees with him is ignorant, arbitrary increases in licence fees imposed without warning and the GPDA shoved aside as the FIA and FOTA decide that only they know what is best. To see Bourdais rewarded with another season at STR is no more than he deserves and a breath of fresh air in the sport. For once, the right choice has been made. I am glad Bourdais got the drive and look forward to see what kind of progress he will make in his second season. I am also curious to see how he combines F1 with his sportscar program. He has been named in Peugeot's team for both Sebring and Le Mans. Hopefully with the testing ban more F1 drivers will be encouraged to race in other classes and let us see how good they really are. I am very happy to see SeaBass returning for a second season and fully expect to see him put up some better results. The thought of someone showing their best form in just one season is ridiculous. Steven: Yes, it should be interesting to see how Sebastien does at Le Mans, as well as how he fares in F1 this season. I suspect that he is much better than we have seen so far. Aracer: I hope that Bourdais shows everyone that the decision to retain him this season was correct. With adrian Newey's design looking good so far in testing, Sea Bass just might be in a position to trouble the leaders. I think Scott Speed will be at the top of everyone's list because of his experience in F1. Other's to consider for the all USA team...AJ Allmendinger, Jonathon Bomarito, Jonathon Summerton, Alan Sciuto, and of course, Graham Rahal. In my mind..Marco Andretti is over rated. "I think Scott Speed will be at the top of everyone's list because of his experience in F1." Thing is, he's lost interest. He's already declared he'd rather stay in NASCAR. USF1 will get Marco, mark my words. No way can they resist the backing of the Andretti name. A cash-strapped team can use that name to get TONS of US-based sponsors. His teammate? Could be anyone from Danica Patrick to Graham Rahal. But I'm betting they may want a veteran as a calming presence on the program, for at least a year. Which is why I'm putting my neck on the line and guessing that they'll get (or at least try to get) Dario Franchitti. Good sense, Journeyer, and Marco is definitely a strong possibility. And latest speculation is that Danica could be offered a drive. All sound sponsorship-gathering stuff. I meant that Scott should be at the top of the list, however, even with his stated preference. Money is an important factor to a new team but so is experience and there just isn't an American driver with anything like the experience Speed has. I like the idea of Franchitti but his time for F1 has passed, I think. Besides, he's not really American, is he? I honestly think Speed can be talked back into F1 because he feels he has unfinished business there. 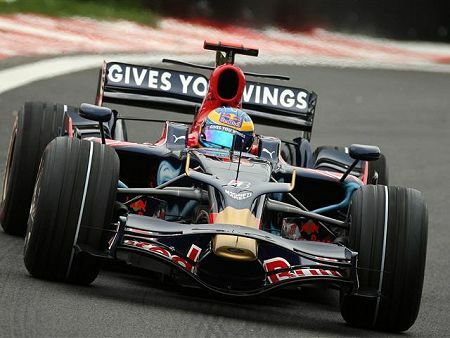 He's backed by Red Bull and is happy where ever they are paying the bill for him to drive. What people are happy with in Nascar is the money....which is on the decline. Franchitti would have a battle on his hands with his wife, Ashley Judd about racing in Europe full time. He would also be 37 by the time a team is ready to race. Danica Patrick and Marco Andretti can bring the most sponsorship $, but can they get the needed results to keep the ride if they get it? Marco is not what his Grandfather or Father were in a car. Outside the car, he is aloof to say the least. hmmmm, maybe he will fit in in F1. I always think a team that needs sponsorship should have one pay driver and one with experience. That way you get some money, at least, and have a chance of being reasonably competitive. It worked for Brabham when Bernie was running it.